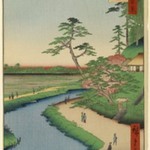 This scene depicts the area known as Yamashita ("Below the Mountain") in Ueno Park. 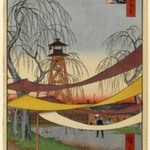 The abstract band of pink and yellow represents the famous cherry blossoms of Kan'eiji Temple ("The Mountain"). 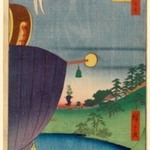 The small shrine hidden in the woods is Gōjō Tenjin, and the adjacent restaurant is Iseya, which advertises a rice dish blended with pickled shiso, a minty herb. 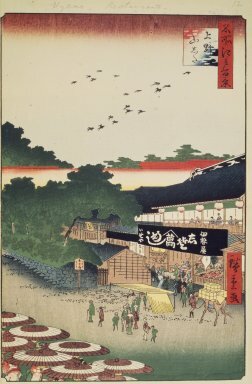 The procession of parasol-covered women in the lower left corner may be a group of ladies-in-waiting. 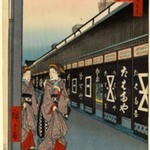 Stopping to gaze at them is a group of commoners, somewhat awkwardly diminished in size. 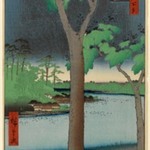 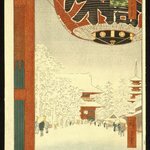 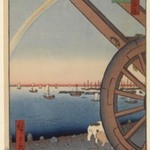 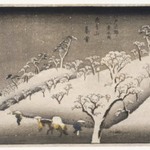 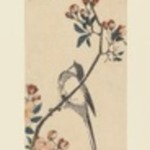 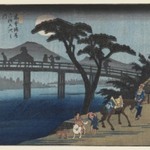 This print is one of three in the series that have been ascribed to Hiroshige II. 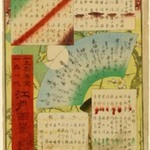 MARKINGS Publisher, censor seals not visible, probably lost when left edge was trimmed. 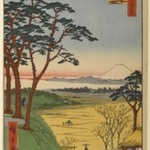 CATALOGUE DESCRIPTION This is the area down as Yamashita ("Below the Mountain"), the broad open space extending from the southern approach to Kan'eiji (the "mountain": see previous print) along around its eastern side. 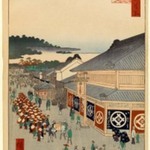 Here the stone-walled enclosure (the black wall at left center) leads into the temple compound. 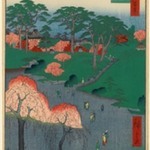 To the lower left is a procession of parasoled ladies, possibly a group of ladies-in-waiting from one of the daimyo mansions, on their way to Kan'eiji to pay their respects on the memorial day of the Tokugawa ancestor buried there and enjoying the cherry blossoms along the way. 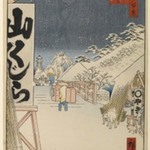 The small shrine hidden in the woods is Gojo Tenjin, and the adjacent restaurant, the Iseya, advertises a dish known as shisomeshi, rice blended with pickled shiso (a minty herb). 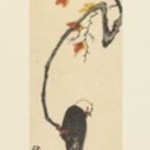 Iseya later adopted the flying-goose motif from its ridge ornament as the basis of a new shop name, as well as a new dish: Gannabe ("goose-pot"), a kind of chicken stew. 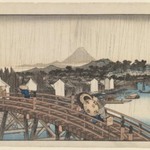 The interior here shows a fish shop below and the restaurant above; all depicted in bright detail. 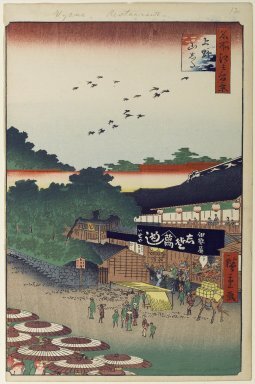 A flock of crows flies overhead. 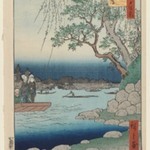 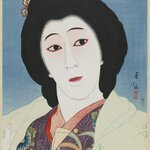 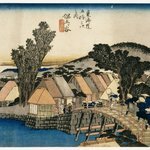 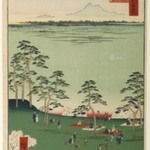 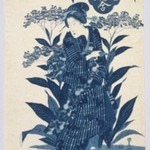 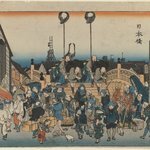 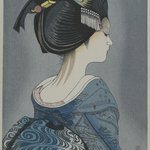 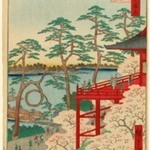 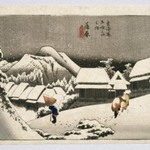 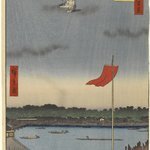 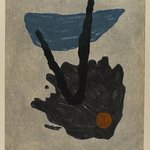 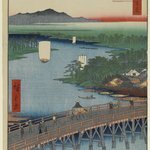 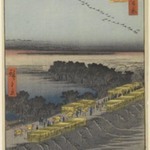 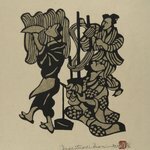 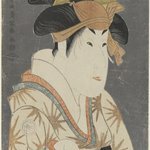 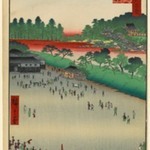 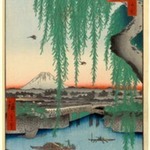 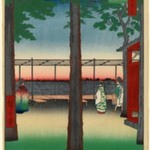 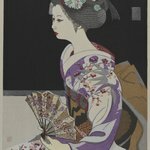 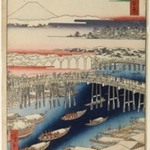 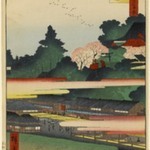 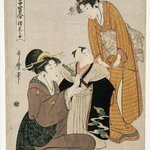 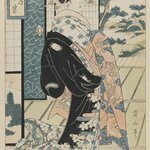 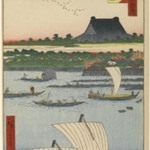 This is one of three prints in the "One Hundred Famous Views of Edo," together with pls. 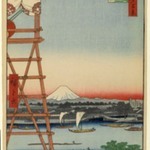 41 and 114, that bear the censor's seals for the Tenth Month of 1858, the month following Hiroshige's death. 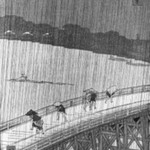 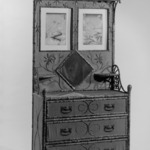 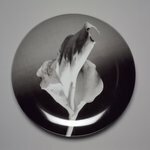 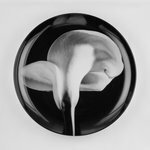 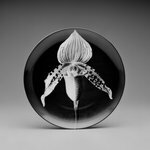 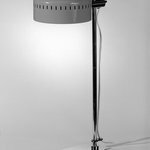 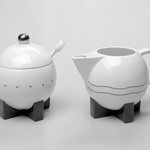 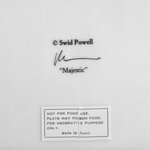 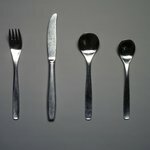 The artist may have left completed designs at the time of his death which had not been formally approved. 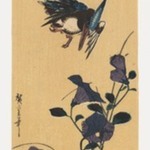 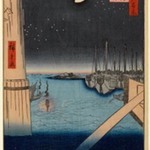 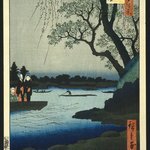 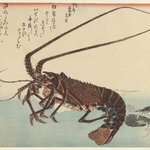 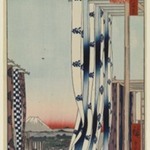 However, the theory has been advanced that these three prints were in fact the work of Hiroshige II. 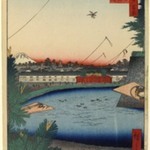 Reference is made to Uchida Minoru, "Hiroshige" (1930). 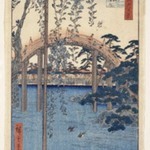 It may be that Hiroshige himself executed preliminary sketches and that it was only the final version which was executed after his death. 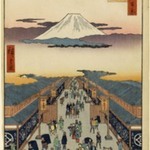 It is also possible, noting the close master-disciple relations, that a disciple other than Shigenobu, the future Hiroshige II, was involved.